New Space companies partner for launches as small sat industry blasts off. Helsinki, FINLAND – Aug 22, 2018 – ICEYE, an Earth observation company creating the world’s largest Synthetic-aperture radar (SAR) satellite constellation, today announced an agreement with ECM Space to launch two or more ICEYE SAR satellites into different target orbits over the next years. Leveraging ECM Space’s experience launching small satellites, the partnership will contribute to ICEYE creating the world’s largest SAR satellite constellation by the end of 2019, aimed to critically increase the frequency and availability of SAR satellite imagery for business and government customers. As part of the longer-term agreement, ECM Space will provide launch arrangements to ICEYE as the company forges ahead on the development of its initial 18 SAR satellite configuration. The first two launches of the cooperation agreement will be performed starting this year through 2019. Tackling a global shortage of actionable land and sea data, ICEYE’s radar satellites provide SAR imagery taken every few hours of any point on Earth, regardless of the time of day or cloud cover. Using this rich data and the fastest revisit rates for reliable imaging, ICEYE helps solve problems in a wide range of sectors, such as maritime, disaster management, insurance, finance, oil and gas, security and intelligence. “ICEYE is quickly moving forward with the launch of our constellation of SAR satellites with a key focus on efficiency,” said Rafal Modrzewski, CEO and co-founder of ICEYE. “By partnering with ECM Space on launch arrangements, we can keep focusing on the advanced development and operation of our SAR satellites.” ICEYE aims to launch 9 upcoming satellites by the end of 2019. Other assets available at https://www.iceye.com/press . 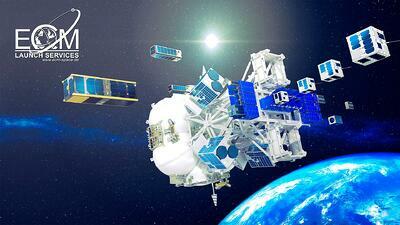 "Illustration of satellite deployment by ECM Space."